HomeUncategorizedGirls Pre-Order your Micromax Bling2 Android and take home a Complementary Satya Paul Clutch! Girls Pre-Order your Micromax Bling2 Android and take home a Complementary Satya Paul Clutch! On the occasion of Mother’s Day, Micromax announced the launch of it’s latest Android phone targeted at women. Micromax has started prebooking of Bling2, which is 3G and GPS enabled, has features like Swarovski keys, 3 megapixel camera, and 32GB external memory. 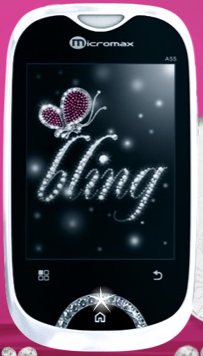 Bling 2 features Android 2.2, 2.8 inch display, 3MP camera, 32GB microSD card support and WiFi along with the usual GPS, Bluetooth and 3.5 mm headset jack. All you have to do is visit any of the following shops at Udupi/Mangalore – Just pay Rs. 500 to pre-book and also get a complimentary SATYA PAUL clutch. 1. Inland Avevue, Shop No, G2, M.G.Road, Mangalore – 575003, Mangalore – 575003. 2. UG-22/A, GROUND FLOOR,CITY CENTRE MALL, K.S.ROAD, Mangalore – 575003. 1. DOOR NO: 9-4-52. , UDUPI MUNICIPALITY, UDUPI -, Udupi – 600000. We are not sure of the Udupi address, which looks very dubious. So for now, we suggest the City Centre Mall in Mangalore.